Andy Murray was born on May 15, 1987 at Glasgow, Scotland. His father William Murray was a former professional footballer and his mother Judith Murray was a former professional tennis player. He took interest in tennis by seeing his older brother Jamie play. He went to the Dunblane High School after which he studied at the Schiller International School. He met his first coach Leon Smith at the age of 11. Within one year Murray was able to win the prestigious Orange Bowl competition in his age group. In the year 2003, started playing on the senior circuit and his first tournament win was at the Glasgow Futures Event. In 2004, Murray went on to win the Junior U.S. Open. That year he was ranked as the No.2 in the junior rankings. In 2005, he was ranked 407 in the world and also selected to play Davis Cup for Great Britain. That year he won his first ATP match at the Queen’s tournament by beating Santiago Ventura in straight sets. He also was able to reach the third round at Wimbledon becoming the first Scottish player to do so in the Open Era. That year he also made it into his first ATP finals at the Thailand Open. With his exploits in the year 2005, Murray had climbed the rankings to reach the No.64 spot in the ATP rankings. In 2006, he reached the fourth round of both the U.S. Open and Wimbledon. He also caused the biggest upset of the year by beating World No.1 Roger Federer; being the only person other than Rafael Nadal to do so. Murray had signaled his arrival at the big stage with this huge triumph. That year he also won the SAP Open Title beating World No.11 Lleyton Hewitt. He was now in the top 20 rankings in the world, even before turning 20 years old. Murray’s consistent performances took him from being ranked World No.11 in the world in 2007 to World No.4 in 2008. Andy Murray reached all the major semifinals in the year 2011 but was unable to grab the elusive Grand Slam trophy. He was being plagued with injuries and many were thinking that this talented Britisher would never be able to win any major title with consistent dominance of players like Federer, Nadal and Djokovic. 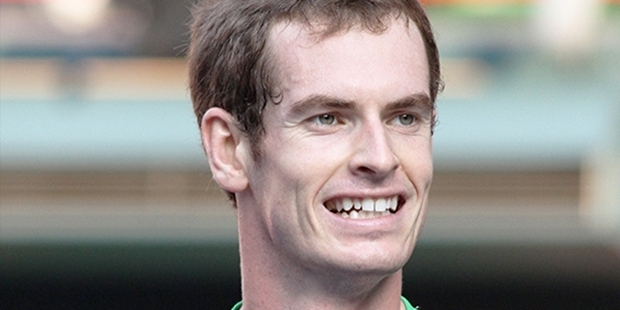 But 2012 was the year that would be the turning point in Murray’s promising career. Inspite of losing in the final of Wimbledon to Federer, he went on to defeat him in straight sets in the finals of the Olympics. This made him the first British Olympic Singles Champion in over 100 years. He continued his form by beating Novak Djokovic at the 2012 U.S. Open in five sets. This made him the first British player since 1977 to win a Grand Slam singles tournament. In 2013, he went on to win the Wimbledon title to become the first British man since Fred Perry achieved the feat in 1936. With this victory he had become the poster boy of the British media. He had accomplished his potential after so many near-misses to fulfill the dreams of his countrymen. As of 2013, he has earned more than $30 million in prize money only, ranking sixth in the all-time list. Today he is a strong contender for every Grand Slam major trophy and is one of the popular sportsmen on the planet. The World No. 2 Andy Murray defeated Juan Martin del Potro 7-5, 4-6, 6-2, 7-5, in the final at the Rio Olympics,2016 becoming the first player to win two gold medals in the tennis singles events.